The seven fundamental process steps that make the most difference in value-based selling. How to identify the specific value-drivers that actually matter to your prospects and customers. How to understand how your primary competitors really stack up on the priority value-drivers. How to quantify and articulate the differential value gaps through your processes and tools. Learn what research conducted by AskForensics reveals about the real reasons companies fail to retain strategic accounts and what they can do about it. 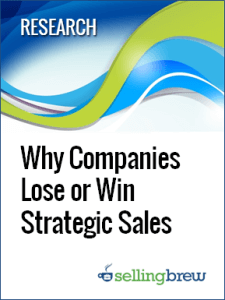 What can analysis of over $6 billion worth of deals teach you about why companies win and lose sales? And what does the research say about the actions that can help you win more and lose less?